Please join us on 1 June 2018 for the launch of Caress. A Candid Approach. a publication collectively edited by second year International MA Curating Art students. Taking Care of Realities, artist talk by artist Emmeli Person in conversation with curator and editor Neuza Faria. Caress. A Candid Approach. is a collection of thoughts, shaped by the notion of care and care taking. A starting point for this publication is our realization that care is an intrinsic part of our own practice as curators, educators, organizers and artists. In the process of articulation, we captured the notion of care by engaging in conversations, gathering different approaches, ideas and practices – a caress, only a fraction of what is essentially beyond measure. With the launch of Caress. A Candid Approach. we introduce the outcome of this collective editorial journey, and add an additional dimension to it by bringing the publication’s content to life through conversation and music. Throughout the evening you will also be able to engage with audio and visual presentations of the content. Sentences on care by the editors, spread in Caress. A Candid Approach, 2018. Emmeli Person is an artist based in Stockholm. Currently co-running the learning program at Index, she researches how preschool children use the concept of reality. Her sculpture-based practice leaks into collective formats, using fiction to undermine semiotic structures. The Great Learning Orchestra is a network with more than one hundred musicians from different genres, cities and countries. The idea is to come together to explore music where listening is the main focus. The orchestra is based in Stockholm but work with composers and musicians from around the world. a4 room is a cross-border project between visual art, composed music and improvisation which was initiated in 2004 by Leif Jordansson for The Great Learning Orchestra. Read more on the Great Learning Orchestra on their website, the website of the a4 room project, and facebook page. 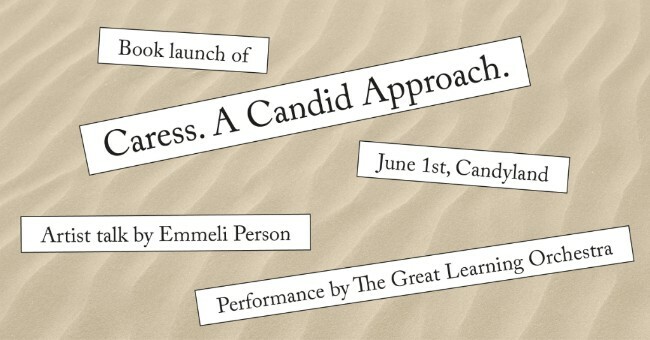 The launch of Caress. A Candid Approach. is organised as part of the curriculum of the second year MA Curating Art, International Master’s Programme at Stockholm University. Copyright © 2018, Editorial team of Caress. A Candid Approach, All rights reserved.